The Hebrew Web Corpus (heTenTen) is a Hebrew corpus made up of texts collected from the Internet. The corpus belongs to the TenTen corpus family which is a set of the web corpora built using the same method with a target size 10+ billion words. Sketch Engine currently provides access to TenTen corpora in more than 30 languages. Data was crawled by the SpiderLing web spider in August 2014 and comprise of more than 890 million words from 20,000 web domains. The heTenTen was tokenised by modified Yoav Goldberg’s Hebrew tokeniser. Sketch Engine provides two version of heTenTen Hebrew corpora. Hebrew Web 2014 (heTenTen14, Meni/Alon tagged + lempos) – part-of-speech tagged version with the access for the academic purpose only. In this version, there are available word sketches and thesaurus, the features requiring the POS tagging. The heTenTen was annotated with morphological categories by Meni Adler‘s tool with thanks to Noam Ordan. Access to the corpus is only limited to academic use. To gain access, send an email to support@sketchengine.eu with a proof of your academic affiliation. Hebrew is a language with a rich morphology. The tagger output in Hebrew has 27 different attributes, some of which are relevant only to certain parts of speech. Apart from usual attributes such as word, tag and lemma, there are transcriptions to latin alphabet, various morphology categories (affixes), various grammatical categories (gender, number, person, case). The tagset reference can be found below. More about the annotation. Whenever an attribute is irrelevant or missing, its value is string ‘NULL’. For example, to search for all nouns in the corpus which are prefixed with the definite article, issue the following CQL query: [tag=”noun” & prefdefinite=”NULL”]. Whereas the token and lemma attributes are available both in Hebrew alphabet and romanised transliteration, the prefix string and the suffix string appear only in transliteration. 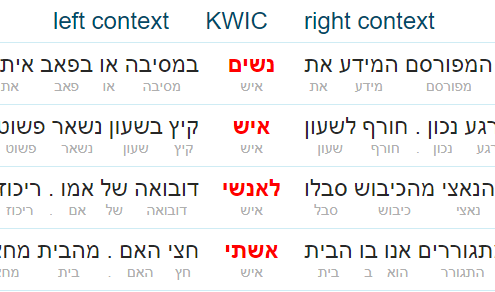 Sketch Engine offers a range of tools to work with this Hebrew corpus from the web.